Cadiz is the oldest city in Andalusia - over three thousands years old - and has a pretty unique personality. The same can be said for many of the boutique, romantic hotels in Cádiz which range from sea side resorts and hotels to luxury city hotels. The city itself is located in the southernmost part of Spain, and separated from Africa by the strait of Gibraltar. The province of Cadiz itself is actually mountainous, with the ranges of Algodonales, la Mota, Líjar, Grazalema and Santa Margarita being located in the north-east, whilst the sierras of Aljibe and Líbar are to be found in the south. 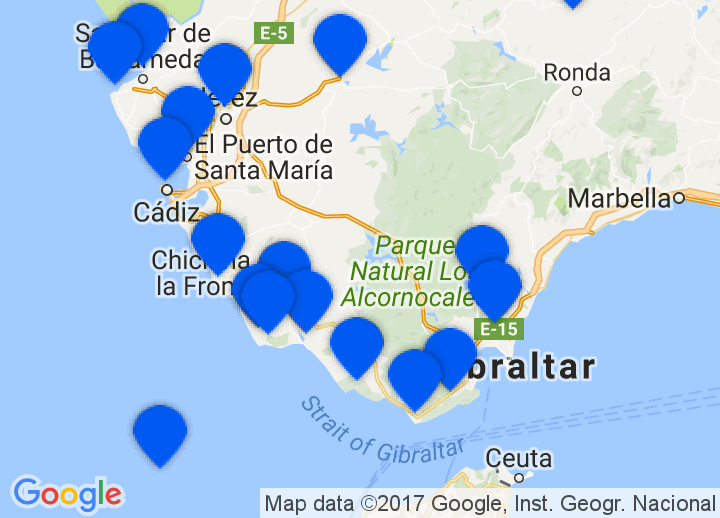 Choose from unique selection of the best hotels in the Costa de la Luz and Cadiz, including small boutique hotels in Cádiz, fincas, cortijos and romantic bed & breakfasts in the Costa de la Luz. Puerto de Santa María is synonymous with beaches. Conil, Tarifa (windsurf capital), and Barbate... are known for their shoreline, fishing, fine sands, and pine trees. The area near Gibraltar is rich in pastures and cattle ranches. Jerez de la Frontera (Sherry) produces world-famous wines, as well as horses and bulls. The farmhouses, and the sandy soils planted with vineyards, in the flat lands of Jerez, are an exact replica of the old, conservative, Andalusia and its deep-rooted tradition. This region abounds in popular festivities. In addition to the traditional Horse and Bull Fairs, mention should also be made of Spring Fairs at Jerez and El Puerto de Santa María; the flamenco Festivities also at Jerez; the festivals at Algeciras; the solemn Holy Week celebrations in Cadiz and villages; and the merry local festivities at Chiclana, Vejer de la Frontera, Rota and Barbate. Yet whatever the fiesta, be it a local or purely private occasion, it is sure to bear the indelible stamp of the Andalusian character and temperament, the charm of the local singing and dancing, into which both the men and women of Cadiz enter with wholehearted and carefree abandon.